Makin' it in Memphis: I want it now! What I don't like? The price. It is $1298, plus tax/shipping. I know that this is about the price of a nice piece I'd find in an antique store and that it is probably very much worth the money, but that is 10% of our kitchen budget! Target's is a bit smaller, at 44W versus 51W and 70H versus 76H. Apparently the "glass" is actually plastic and it does require some tricky assembly. What do you guys think - is the Target one a close enough look to warrant the $500 price tag? Oh for Pete's sake...just get it over with and order one. I would personally root for the one from C and B. I think it is probably better quality. Think long term, and you should have at least one splurge in your project. PLUS, you probably won't live in this house forever...this is something that will go with you to the next house, etc. Also-What about the one you saw in Bojo's? That one was beautiful. Needed a little work, but it was very nice. 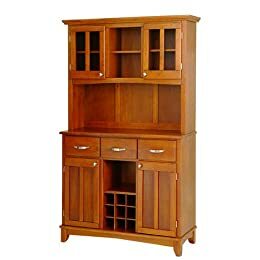 What would be the pricing on buying a buffet and then stacking a hutch on top? If you're not married to a wood finish, you could always get separate pieces and paint them.